I like to start my mornings with a steaming mug of chai latte. I like Oregon Chai; they make a decent liquid concentrate. 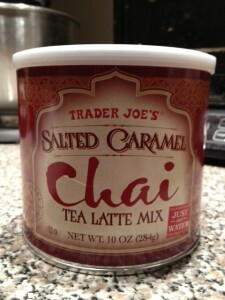 My love for all things salted caramel should be evident by now, so I was excited to see Trader Joe’s Salted Caramel Chai mix! It’s like my two favorite things went and had a love child. There’s a scoop that measures 3Tbs for 6ozs of water. I used skim milk instead. I thought it was delicious, a marriage of salty and sweet with a hit of caffeine. The problem with TJ’s is that many items are time limited and once it’s gone, it’s gone. This is a holiday item, so I went back and stocked up on 2 more canisters. I’ll be sad when they are gone. Ok so I have a lot of favorites. But caramel is definitely up there!